News junkies have good reason to rejoice over the NYTimes app for the iPhone and iPod touch. Say what you will about the New York Times, it remains one of the finest newspapers in the United States. Unlike many old media institutions, the Times recognized early on the need to embrace new media innovation. The newspaper’s Web site is one of the most popular on the Internet, attracting about 13 million readers a month. The Times’ AvantGo portal was speedy and popular with users. It was only natural, then, that the Times would develop a free application for the iPhone and iPod touch that extends its online brand further. Here Now, The News: The NYTimes app delivers the day’s paper to your iPhone or iPod touch. Even though the Times app is a boon for newshounds, it’s too bad the app is so much like old media: Really, really slow. How so? Well, traditionally, a newspaper would be assembled by hand. A reporter would write a story, file it with his editor, who would then rework the copy and send it to the copy desk for more work. After much mysterious back-and-forth, the story would go to the composition room to be laid out on a page in orderly columns, complete with attractive headline and maybe a photo for the next day’s edition. This process would repeat until the pages were ready to go to press. Bundles of papers would then be loaded onto trucks, where they would spread out across the city in the wee hours, landing in readers’ shrubs and soaking-wet lawns for their edification. 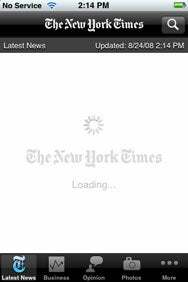 In the time it took to read that paragraph, there’s a fair chance that the New York Times story you wanted to read is still loading on your iPhone. All The News That’s Fit to Load: Here’s a screen you’ll see a lot of when you use NYTimes. The Times app is so slow that as I waited for it to load a short Sunday editorial on a resurgence of measles, I was able to launch Safari on my MacBook, navigate to the Times Web site, find and read the editorial before it finally popped up on my iPhone’s screen. Why is the Times app so slow? Because it downloads the entire day’s paper to the device. The rationale for this isn’t bad: In theory, a user would tap the Times icon on the phone and get a bagel and a cup of coffee while the application syncs with that day’s paper. A reader doesn’t need a connection to read the articles that have already downloaded, making for easy, uninterrupted reading for commuters with spotty Wi-Fi en route to work. Yes, it’s great to read news and view photos offline, after the seemingly interminable download. And the Times app has a crisp, clean interface with simple navigation. Once they do load, stories are very easy to read. Ads at the bottom of the screen are unobtrusive. The text rotates for horizontal or vertical viewing. And it’s hard to complain about speed when the application is free. (Kindle users pay $13.99 a month for the privilege of receiving the Gray Lady wirelessly.) But those nagging download issues detract from an otherwise satisfying news-reading application. 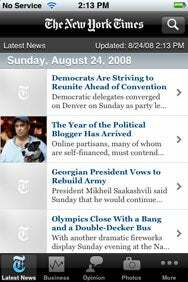 The New York Times app is compatible with any iPhone or iPod touch running the iPhone 2.0 software update.